This micro-cluster contains four hosts (proton, electron, neutron, and photon), and is a fully functioning Atomic cluster. If you want to see it in person, I will be demoing it at DockerCon in Seattle at the Red Hat booth, where I will also be raffling off one of the minnowboards with Atomic Host pre-installed. I will also be showing it off in the Community Central pavilion at Red Hat Summit. For my fellow Portlanders, you can get a look at the Sub-Atomic Cluster early if you come to PDXPUG, where I will use it to demo high-availability containerized Postgres. On this blog, I’ll show you how I built it, so that you can create your own. More usefully, most of the steps and techniques used for creating the cluster are the same as what you’d need on real hardware, so consider this your introduction to bare-metal deployment of the Atomic platform. First, let’s talk about the hardware. The four boards are Minnowboard Turbots, which are small maker boards, similar to the Raspberry Pi, but using an Intel x86 chipset (Atom E3826). That means that we can run Atomic Host and other software without needing to recompile it for ARM, and makes it a much better testbed for real Atomic. Currently, one of the boards has a helper board ( lure ) with an SSD; the remaining cards are running off SD cards. 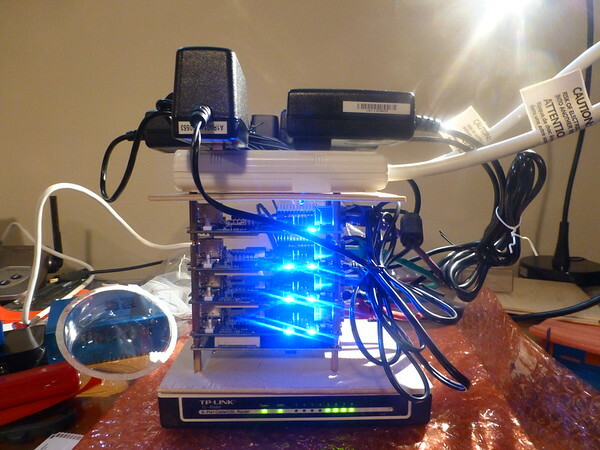 I’ll be adding more SSDs to the cluster later so that I can demonstrate Kubernetes HA configurations. The boards are stacked using 3mm brass standoffs, and capped at either end with ¼" craft plywood. As you can see, those plywood boards are there to hold two things: a mini power strip for the Minnowboard power, and an 8-port router to connect the cluster. We need the latter in order to assign fixed IP addresses to all four boards, since Kubernetes is a lot happier configured that way. I’m using a TP-Link TL-R860. Amusingly, the power and networking are larger and heavier than the boards themselves. You could slim this down by using wireless networking, but since I’ll be taking this cluster to conventions, that wasn’t really an option. Once everything was plugged in, it was time to install Atomic Host on all the nodes. Ideally, I’d use Foreman for this, but I had constraints setting up a Foreman image server which would have required another board with SSD, so using Foreman will need to be a blog post for later. I also thought about establishing a kickstarter file on the local network, but with only four boards it didn’t seem worth it. Instead, I installed manually. After some experimentation with installation methods, it turns out that installing from a USB key with an ISO image is really the best way; while you can write a raw host image directly to an SD card, it won’t be sized right and you’ll need to take a bunch of manual steps to make all of the space on the SD card available. Then save to boot it up. In a few minutes, the screen will display the VNC server address, which you can then connect to using a VNC client (Remote Desktop or TigerVNC on Fedora), giving the password you set in the boot line. Beyond this, installation is rather simple; just accept the defaults for everything. This will create an Atomic Host with 40% of the disk given over to the docker pool, which is what you want. If you’re installing to an SD card on the board, you’ll want to make space by reformatting the card through the installer. Also, set a root password, and an administrator user named atomic for sudo access. One thing you’ll notice is that you don’t choose packages to be installed. That’s because this is Atomic Host, and you don’t install individual packages on it. Instead, you are installing an image of a filesystem tree which comes from a central RPM-ostree server; in this instance, one run by the Fedora project. Specific applications are installed as containers. Once everything is installed, remove the USB key and reboot. Note that you will need to choose the SD card or SSD from the BIOS boot menu on the first reboot, so that the Minnowboard will remember it thereafter. When you’ve rebooted, there’s one more thing to do: run rpm-ostree upgrade to bring the host up to date with the latest filesystem image available. You’ll notice above that I installed the April 20th image, so this will bring me up to the latest image available (May 24th), updating all software. For this reason it doesn’t really matter if you install an image that isn’t the latest. Now, we’re up and running and ready to build a cluster. Next step: configuring the cluster with Ansible.